Since prehistoric times, man has used Jade for tools, weapons, jewelry, religious ornaments, and other purposes. Primitive people in the British Isles sharpened it into axe heads and knives. Tribes in Mexico, Central and South America, and New Zealand fashioned it into deity masks and cast it into wells, hoping the water spirits would bless them with fresh water. But it’s China that values Jade as much as Americans value diamonds. Prized not only for its beauty but also for its powers of healing and protection, Jade was carved into jewelry, statues, burial items, vessels, and even musical instruments. This beautiful stone is actually two different minerals, jadeite (rare) and nephrite (common). Jadeite is an aluminum-rich pyroxene; nephrite is magnesium-rich amphibole. Both are translucent opaque minerals, with a 6-7 on the Mohs scale of hardness. Both varieties have been found in China, Russia, and Guatemala; the best stones come from Burma (now Myanmar). 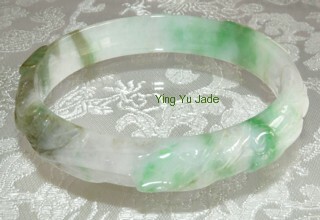 This one-of-a-kind Burmese jadeite bangle bracelet is one I found at Ying Yu Jade’s online store. Price: $3,888! Besides its customary green form, Jade also appears in white. lavender, yellow, blue, black, red, orange, and grey. Ancient peoples revered Jade as the ultimate “Dream Stone,” encouraging creativity and access to the spirit world. It also serves as a talisman, assuring long life and a peaceful death. Jade is protective for travelers and gardeners. It supports new love, increases fidelity, and inspires love in later life. It’s said to help healers make practical diagnoses, supports educators, and lifts up military personnel. It signifies peace through strength. Green Jade balances the heart chakra. While it’s not a traditional birthstone, it is the stone for those born under the zodiac signs of Taurus and Libra. Feng Shui practitioners believe Jade dragons, fish, frogs, and statues of Buddha attract good luck and prosperity, especially when placed in a home’s east area to draw new opportunities and health. In China, Jade carved into the shape of a butterfly is a powerful symbol of love. It is believed that Jade was the twelfth stone in the breastplate of the High Priest, Aaron. Jade is said to impart a feeling of calm and aids in the release of negative thoughts. Place a piece of Jade between two purple candles. Light the candles and let them burn a while, then carry the Jade as a protective amulet. This entry was posted in Sunday's Gem and tagged healing gemstones, jade, properties of Jade. Bookmark the permalink. I had no idea that jade comes in so many colors. I always think jade=green. And I didn’t know the symbolic meaning of the butterfly. I’ve seen jade butterfly boxes here and there, and thought they were pretty — I didn’t realize they had such power, too. I thought it was interesting that jade describes such a beautiful stone, but also describes a person who is world-weary, or “jaded.” As so often happens, the OED sheds light: there are different backgrounds for each word use. Words are infinitely fascinating to me, Linda! Before you pointed it out, I hadn’t thought of the different meanings for the word “jaded.” Thank you. I think the apple-green variety of Jade is probably the most typical. I like the lavender shade, but I don’t think I’d like gray or yellow (I’ve certainly never seen Jade in those colors). A girl who used to work in a Chinese restaurant here wore the most beautiful Jade bangle bracelet. Something that simple, so smooth, just appeals to me! Interesting history behind the stone, Debbie. DD, I know just what you mean! I think we all could use a bit of Jade in our lives — besides, it’s so pretty and green goes with everything, right?!? I’m so happy Jade is a stone. I always like Jade and now I know why. Thanks, Debbie. I’ve always liked Jade, too, John. Something sort of mysterious about it, and I love how cool it is to the touch. Thanks for coming along! Thanks, Christy. I’m glad if I can help by compiling some info on these lovely stones. I think a Jade pendant would be a wonderful addition to one’s wardrobe! Yes Debbie, you’re absolutely right about that. Being someone who has trained, studied, and practiced energy work (Reiki and Reflexology), I know how important the chakra system is to our health (both physically and mentally). Jade is a very powerful gemstone. Now that I didn’t know. How interesting, because I’m a Libra and I love Jade, however, my birthstone is Opal. 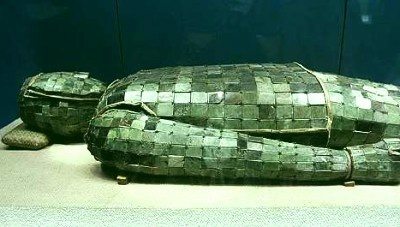 I love the first photographed you shared of the jade burial suit. How beautiful! 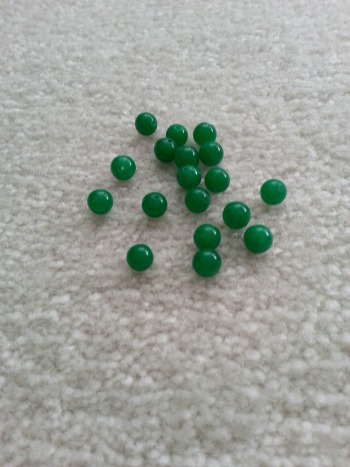 I know that jade comes in various colors, however, I love green jade the most because green is my favorite color! Thanks so much for sharing another fascinating gemstone post. I really enjoy them! Have a super week, my friend! Thank you, Ron. Green is my favorite color, too (blue is a close second), and I learned a lot about Jade from this post. I can’t imagine being buried in a Jade suite — shouldn’t just a piece or two have been sufficient?? I’m with you — green is my favorite shade of Jade. I’ve never seen any of the lavender pieces, but something tells me they, too, would be lovely. I’ve always thought jade was lovely. I finally purchased a pendant a few years ago. Ooh, I’ll bet it’s just beautiful — lucky you! How interesting, Debbie. We could all use a little jade in our life. Must get some! Sounds good to me, Audrey — and it will bring out the green in your eyes, too! It is so interesting to learn about the different layers of information surrounding gem stones. I think maybe it’s a good time for all of us to be wearing jade after this election :-D. My mother gave me a jade necklace when I was in Jr. High and has always been my favorite. What a lovely present! You’re fortunate that your mother gifted you with a beautiful healing stone, Lana. Jade is such a pretty stone. I have a Jade ring that I just love. I knew the Chinese loved jade but the rest of the post was enlightening!. I have a bunch of purple candles so I may place my ring between them and breath in the calm. Why not! Let me know if it works, Kb!! I’m sure your ring is just lovely, cleansed by the candlelight or not. But, hey, we can all use a bit of calm about now, right??! Absolutely these things work – our minds are so powerful – as are our spirits. Very interesting post, Debbie. Thanks for confirming my suspicions, Barb! I guess our Creator really put everything here that we’d ever need, right? !